(Newser) – Tom Hanks' next role: Sir Lachlan Hector Charles Maclean? The Scottish lord has for the last 26 years been dealing with the king of all money pits. 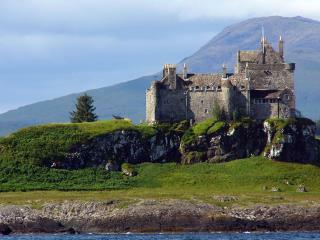 Repairs on the 14th-century Duart Castle he inherited have thus far cost just shy of $2 million, reports the New York Times, which spoke to Sir Lachlan in his living room—"probably one of the snugger parts of the castle ... though it was still mildly damp." That dampness is the issue. The castle "leaks like a sieve," per a Times of London article from July on a $420,000 grant awarded for wall repairs. Those walls are 16-feet thick, and yet apparently still unable to keep out the incessant rain: Located on the Isle of Mull off Scotland's west coast, rain falls, on average, all but 82 days of the year. Time to let the place be a historic ruins! Say it's haunted and charge more admission. Didn't Peter O'Toole do a movie like that? Find the cracks & inject them.... LOL!